Herbert Nitsch is your Connector of the Day. He’s known as the 'deepest man on earth'. 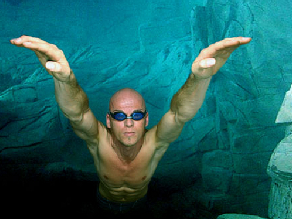 Austrian Herbert Nitsch is the undisputed freediving world record champion, an extreme sport where competitors plunge into the depths on only one breath without any scuba diving equipment. He took the title in 2007, diving down to a record depth of 700 feet off the Greek island of Spetses. His record-breaking career started with a fluke when, in 1999, Nitsch lost his diving equipment on the way to a scuba dive safari. That forced him to take up snorkeling instead, and he quickly discovered his natural talent for freediving. His progress was rapid: a few weeks later, he was only two meters short of the Austrian national record. And just two years later he set his first world record. Since 2001, Nitsch has set 31 worlds in all eight official disciplines recognized by the International Association for the Development of Apnea (AIDA), the ultimate freediving authority in the world. The self-taught freediver puts in a meticulous amount of planning before every dive. He can even hold his breath for a staggering nine minutes. But his biggest test is still to come. In November this year Nitsch will attempt to break his own world record, as he tries to reach a depth of 1000 feet. He’ll do it on only one breath, shrinking his lungs to the size of a tennis ball. When he’s not diving deep, he’s flying high, working part-time as a pilot for Austrian Airlines. Here’s your chance to ask Herbert Nitsch your questions. Write in and don’t forget to let us know your name, and where you’re writing from. herbert, your progress during your first months of practising freediving was nothing like this sport has seen to date, i believe. i want to ask you this: what would you have to say, as piece of advice, to beginners? what should they focus on during those first months of practising? good luck with the 1000ft attempt! any idea about the date? I have just recently started freediving and I´m loving it to bits. I´ve improved quite a bit since I started training. It´s obvious that you have a natural talent for freediving but, is it all due to your habilities?or is it trainable?I mean; do you need to be a certain type of person with some special characteristics, or anyone can get up to a professional standard? Thanks very much indeed. It inspires me to watch you and will love to meet you in the near future here, in Tenerife, Canary Islands, or elsewhere. 1. Which place is for your new (incredible!) NLT record – the island of Spetses (Greece, again) or other? 2. Who will take care of your sled and safety – the team of Stavros Kastrinakis or other?